Just back from a week wandering Appin, Morvern and Mull, I make no apology for having silenced this blog for a whole week. We all need a break but watching sea eagles bringing sudden death to the fish of Loch Sunart or Askival and Ainshval play hide-and-seek in curtains of rain cloaking Rum from Ardnamurchan lighthouse or the Kilchoan ferry slide at dusk in between the dozing boats beneath the Western Isles Hotel was therapeutic beyond my wildest expectations. Meanwhile, back at reality, I open my first paper in yonks and splutter my coffee over a piece in the Hootsmon by the usually astute Douglas Alexander, claiming that SNP policies are causing a waiting list of over 10,000 Scottish students by restricting funding to tertiary colleges while sustaining it to universities. That seems a serious issue and one worth some investigation—so I did. Reading the article , it is apparent that virtually all of the ‘lost’ students are from Numptygrad Central—8,000 from Glasgow colleges and a further 2,000 from colleges in Lanarkshire. Now, while the reduction in funding is real and can’t have helped, why would it be that virtually all the students with this problem have spent their entire education to date under the dominance of the Labour party and their three Lanarkshire redoubts? It’s not that those Education Authorities get any less money per pupil than anyone else. Apart from the tendency to run half-empty schools—which should make for smaller class sizes, even if it doesn’t help efficiency—they also don’t have the transport headaches of most other councils and they should benefit from sharing specialists over more pupils, quite apart from the generally good performance achieved by their many Catholic (not to mention Gaelic) schools. But I have no explanation why Glasgow and Lanarkshire vocational students should be any harder to place in tertiary education than anywhere else. And, as it’s clearly not the kids themselves, I can only conclude that it’s the education they’ve been receiving and that the fault lies with a combination of teachers, educationalists and parents in that area. If it were a matter of being shortchanged on funding, I would not be so rash as to make the above statement. But, although Glasgow’s £1/2bn education budget was slashed by some £33.5m. But for its 65,000 (and declining) pupil numbers, that means £7,146 per pupil, which compares favourably with my own East Lothian’s £7,669, especially when you realise ELC is constantly building schools for new pupils, whereas Glasgow needn’t as its rolls have shrunk by over 10,000 in barely a decade. Controversial though it is to say—especially when there are many selfless teachers out there who sincerely believe in the importance of education and go that extra mile—we are not getting value for educational money. Douglas Alexander can try to blame his SNP nemesis but that is no more helpful than my blaming local politicians, as I did above. We need to revisit McCrone because, apart from boosting teachers’ salaries and restoring some much overdue respect and dignity, it has done diddly-squat to improve education. Before an official EIS-sponsored lynch mob shows up at my door, consider this: Scotland pays its teachers better (in purchasing power parity terms) than most countries whose pupils are well ahead on tests and who are generally agreed to now have superior education systems to ours. Scottish teachers on an average $48,611 salary beat their English colleagues by 8.9%, Finnish by 18.7%, Norwegian by 31.3% and Swedish by a whopping 43.5%. This is illustrated on Chart 1 below. It would be fruitless to get into a rammy over whether Scottish teachers were worth 31% than Norwegian teachers. But consider this, if class sizes are such a big deal, our average class size of 26 could be 18 at a stroke if teachers here were paid the same as Norwegians and the money was used to hire 31% more teachers instead. 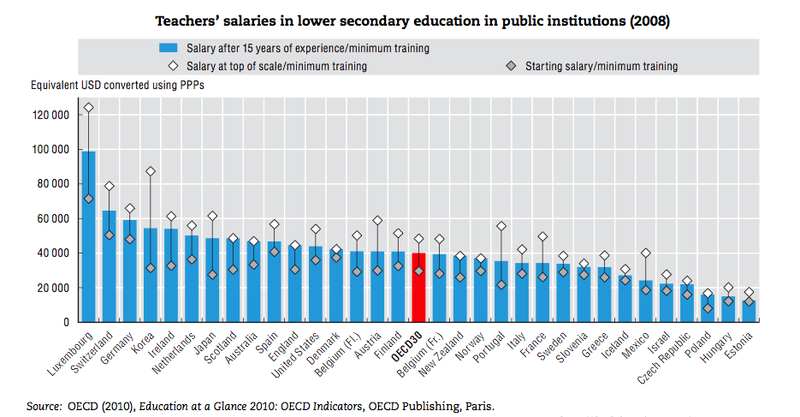 That would take us from 10th most crowded classrooms to the bottom of the table, as shown in Chart 2. Trouble is, I’ve never heard the EIS or any other union arguing this, despite the obvious benefit to both children and education. More often, we hear the opposite from teaching unions—as today at the TUC in Brighton, the two main teaching unions (NUT and NASUWT) were both shaping for a fight with English ministers. They voted to start an indefinite work to-rule protest in two weeks’ time, even though 73% of their members did not actually vote. Some teachers—especially those newly qualified and uncertain of their tenure do have valid beefs with their employers. But those whose salary and conditions boomed under McCrone and want a general strike because their chunky annual salary boost has been frozen need to get out more, read the financial pages during their 12 weeks of holiday and consider that, as professionals, how the welfare of young people under their charge and their vital education would be damaged by indefinite strike action. And, if a class size of 26 is deleterious to good learning, how much worse must a class size of none be? But—bottom line—are we getting value for our money? In Scotland’s 32 councils almost half their £11bn budget is spent on educating the 675,000 pupils (down from 758,000 a decade ago) in the schools they run. Last year, the highly respected PISA (Programme for International Student Assessment) indicated Scotland had slumped to 28th place in maths, 25th in reading and 15th in science. Compared to a decade before, the year the tests in the three subjects on 15-year-olds, we were eighth in maths, seventh in reading and fourth in science. England and Northern Ireland have done much the same but Wales has performed even worse. You decide for yourself whether Scottish teachers would be justified in taking industrial action. A decade ago, I fully accepted they were. But in the intervening decade for a ‘profession’ to receive double the investment, including hundreds of new schools, to perform by sliding out of the top ten into third world territory and then threaten industrial action that would damage kids’ futures in the midst of a major recession just beggars belief that they don’t see now as time for a little humility and self-evaluation. Time someone examined the teachers to weed out failures who don’t deserve over-the-odds payment they already receive—never mind more costly rises, especially when based on time served and not on pupils inspired, sparks ignited or new careers launched. Teaching is a calling that deserves decent remuneration. But if teaching unions can talk of little but member pay rises, they are worse than greedy bankers: at least the people that bankers screw over are adult and capable of retaliation. This entry was posted in Education and tagged EIS; class sizes; educational attainment. Bookmark the permalink.